distribution Throughout the mountains, and scattered across the Piedmont and the western portion of the Coastal Plain, including the Sandhills; a few recent photo records for the lower half of the Coastal Plain (Gates and Jones counties) Apparently absent in all coastal counties and most other eastern Coastal Plain counties. abundance Fairly common in the mountains (at least in the northern counties), but uncommon in the western Piedmont, and rare to uncommon in the eastern Piedmont and Coastal Plain portion of the range. Much more common in the mountains than downstate. Possibly less numerous in the central Piedmont than on either side, as there are many records eastward and westward but with many counties lacking records in this part of the Piedmont. flight Late April to early July in the mountains, but slightly advanced (as expected) in the Piedmont, where it flies from early April and extends at least to mid-June (if not later). The relatively few dates for the Coastal Plain fall from late March only to early May, but the flight surely must extend into June there. habitat Small streams or seeps, often with little flow; typically in wooded areas. behavior Typically flies slowly over streams or seeps or in nearby clearings. Perches on low twigs, in an oblique manner typical of spiketails. 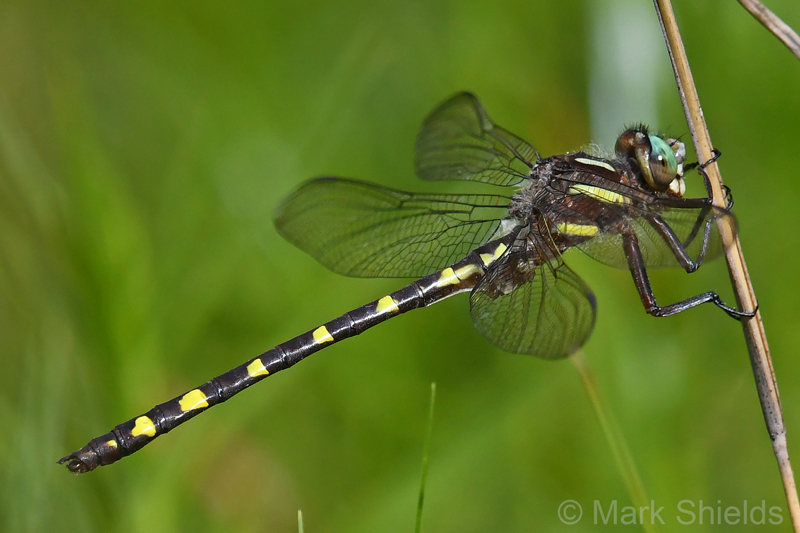 comments This species can be confused with the somewhat similar, but slightly more widespread and definitely more numerous, Twin-spotted Spiketail. Both can occur together along mountain and Piedmont wooded roadsides and clearings along woods and small creeks. This species might have a slight bimodal distribution, as it seems surprisingly scarce in the central Piedmont. Steve Hall and Harry LeGrand saw and photographed the species on several occasions in 2012 near the Roanoke River, adding first records for Halifax and Northampton counties. Surprising were photo records in 2017 by Hunter Phillips for Jones County and by Signa and Floyd Williams for Gates County. Comment: Wayne, 2019-04-15, Cliffs of the Neuse State Park (CLNE) - First record for county. Comment: Orange, 2017-04-22, Patrolling seep at Brumley Forest Nature Preserve. - Males. Comment: Moore; C, 2007-04-08, WEWO - All were perched/hanging from small hardwoods. The cold made them pretty cooperative. Of the 8, only one is documented by a photo.